Britain's Prince Harry and Meghan, Duchess of Sussex walk along the Kingfisher Bay Jetty Monday, Oct. 22, 2018 in Fraser Island, Australia. The Duke and Duchess of Sussex took separate boats Monday to Queensland's Fraser Island as their tour of Australia and the South Pacific continued with a reduced schedule for the pregnant duchess. 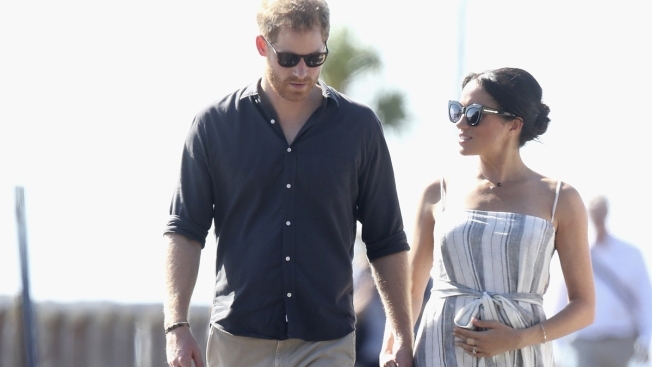 The Duke and Duchess of Sussex took separate boats Monday to Queensland's Fraser Island as their tour of Australia and the South Pacific continued with a reduced schedule for the pregnant duchess. After their boat crossings, Harry was scheduled for a range of engagements on the world's biggest sand island, known as K'gari — or "Paradise" — in the local indigenous language, on day seven of their Australian tour. After taking part in a traditional "Welcome to Country" smoking ceremony with representatives of the local Butchulla indigenous people, Harry unveiled a plaque dedicating the popular holiday island's pristine rainforests to Queen Elizabeth's Commonwealth Canopy project. Harry's itinerary also touched on the history of logging on Fraser Island, whose famed hardwood trees were used to build the London's docks in the 1930s. The paramedics made headlines last year after a photo of them granting a dying woman's wish to see the ocean at Hervey Bay one last time went viral and captured hearts around the world. 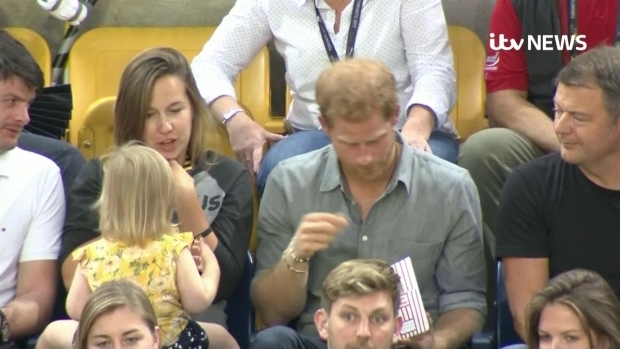 Prince Harry made a new friend at the Invictus Games in Toronto. Unfortunately for him, she was only after his popcorn. Harry and Meghan are due to leave Australia for Fiji and Tonga on Tuesday. They will return to Sydney on Friday night for the final days of the Invictus Games, Harry's brainchild and the focus of their tour, before finishing off with a visit to New Zealand.